1. You and Jack each have huge responsibilities and equal input into making Valmoto a success - what is your secret? My German Efficiency (ha ha, that was a joke!) I like to think that my strength is working hard in the background which keeps Jack free to do what he does best. 2. Take us through your role in the company? I am the "mother hen" of the company and get involved in everything from nursing a mechanic's cold to dealing with logistics, managing hospitality, doing the accounts and making sure that every guest in hospitality gets a once in a lifetime experience at the circuit. 3. What is a typical race weekend like for you? First and foremost making sure that my two dogs are looked after before I set off! I get to the track on Friday and that day is filled with administration, booking in last minutes requests, and general paperwork. Saturdays is set-up day for me, which involves liaising with the chefs and staff and ensuring that everything is prepared for the next morning. Sunday starts early as we welcome guests into hospitality from 9am. I arrive at least an hour earlier to make sure everything is ready and all the catering girls are briefed so that we can have a smooth day. My day is occupied with making sure that the guests are well looked after, all questions are answered, the kids are enjoying themselves and that the occasional hung-over guest gets nursed! There are only two occasions when I sneak out of hospitality and that is our rider's races. No way can I be anywhere else than in the garage at that time! 4. What does a day in Valmoto's VIP hospitality entail? 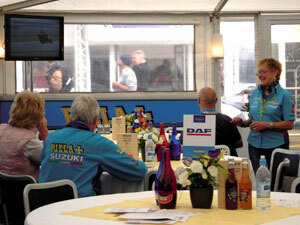 This year we had between 100 and 150 guests in the hospitality unit. We serve morning coffee with pastries which always works a treat! At lunch we provide a hot and cold buffet with a vegetarian option and to fill those afternoon hunger pangs we serve coffee and tea with biscuits. During the day we have two rider's briefings for our guests, which mean that the riders come in to the hospitality venue and talk about their thoughts and strategies for the races. We also have a competition in which three guests get a little present in the afternoon. There is no boredom in our hospitality! 5. What is the most satisfying part of your role? Definitely the smiling faces! Sunday is my favourite day. Even though I am extremely busy and never find time to sit down I love it when people come to me and tell me that they had a fantastic time. That's my reward and makes is all worthwhile.